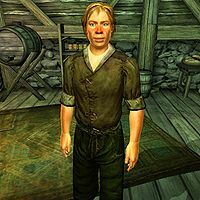 Olav is a Nord publican and the innkeeper at Olav's Tap and Tack in Bruma. Olav sells food and rents beds at all times, never eating or sleeping. He wears typical lower-class clothing consisting of a collared shirt, green felt linens, and buckled shoes. He carries a small amount of gold and the key to Raynil's room. During the related quest he will express his doubts on the presented facts: "I know I may be out of line by saying this, but I think the city guards may be wrong. It's hard to imagine Bradon was a vampire. I could have sworn I saw him outside in the daylight before. Unless he just got that disease very recently, I'd say they were mistaken. When I heard Raynil killed him, I didn't know what to think. But after your visit here, I'm beginning to wonder." He won't help your investigation however, if he has a disposition lower than 70: "I don't usually give out that kind of information. Especially to people I don't know." Otherwise, he will tell you about Raynil's stay: "Raynil is staying in the last room down the hall upstairs. Here's the key. I always liked Bradon and Erline. They were a nice couple. I hope you get to the bottom of this, cause I don't believe he was a vampire either." Upon finding Gelebourne's Journal, you can ask about him: "Gelebourne? That's odd you should mention that name. Raynil told me that he was the last vampire he hunted. Yes... that's right. Somewhere in Skingrad I believe. He said he tracked Gelebourne down and killed him. That's apparently why the guards trust him so readily. They had gotten word from Skingrad's city watch about Raynil and his so-called accomplishment." After the quest, he will express his joy over Raynil's death: "I'm glad that scum got what he deserved. Good riddance." If you failed the quest, however, he will be sad: "Sad that Raynil slipped away like that." Esta página foi modificada pela última vez à(s) 20h27min de 12 de dezembro de 2013.